VANCOUVER, Aug. 7, 2018 /CNW/ - Hannan Metals Limited ("Hannan" or the "Company") (TSXV: HAN) (OTCPK: HANNF) is pleased to provide an update on the Company's forthcoming diamond drilling program at the 100% owned Clare zinc project in Ireland. 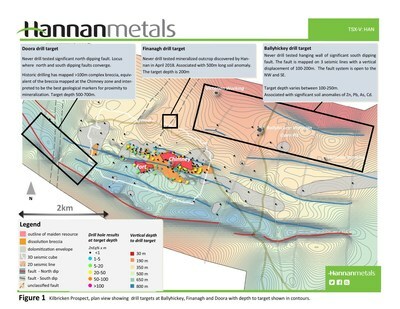 Following the recent closing of a C$1.1 million financing, Hannan is well positioned to progress to the next stage of discovery within the Irish Midlands, one of the world's best established zinc mining districts. Michael Hudson, Chairman and CEO states, "Over the past year Hannan has completed extensive seismic, drilling and geochemical programs at the Clare zinc project. With this bank of new data, the project is now perfectly poised for drill testing of high priority shallow targets adjacent to the Kilbricken resource. Following our over-subscribed placement of C$1.1M, we are moving quickly, with a drill rig soon to be mobilized to site with the aim to define further standalone mineralized bodies." Ballyhickey is a 2.5-kilometre-long untested, shallow target zone adjacent to a seismic-defined fault with a vertical displacement of 100-200 metres. This is the same offset observed on faults associated with mineralization at Kilbricken. The entire trend includes strong multi-element soil anomalies (Zn, Pb, As, Cd) (Figures 2) and includes the historic Ballyhickey mine, one of the most important Victorian-age mines in County Clare, Ireland. Historic reports state the mined "ore" ran 77% Pb and 15oz Ag, with a calcite vein 5-6 metres wide. 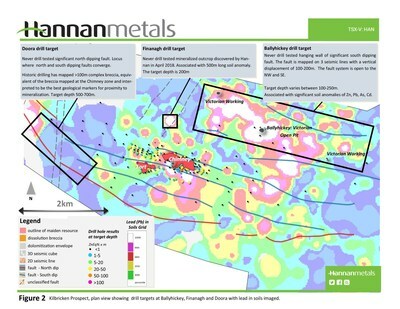 Mineralization in the historic pit is now understood to lie in the stratigraphic hanging wall of the Waulsortian reef, approximately 70 metres above the level of stratabound Zn-Pb-Ag mineralization now targeted across Ireland.